When I first started at an ad agency I’m pretty sure I only understood every other word that was spoken. 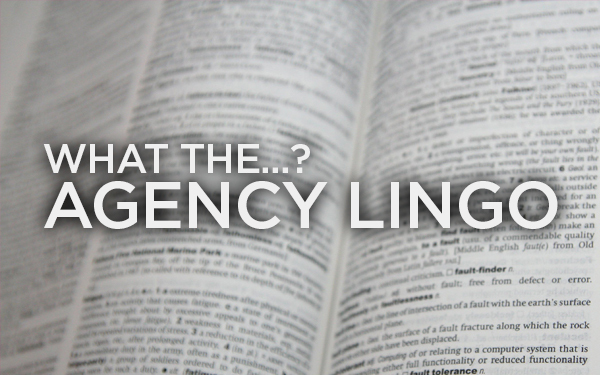 The agency lingo had me all confused. Not to mention, there are some people around here (ahem, Kati Parrish) that like to make up words on the fly. There were many times that I asked questions, but there were also many times when I just nodded and pretended I knew what was going on. The new lingo quickly became a second language. It wasn’t until a new coworker started asking me about certain words that I realized how confusing it was those first weeks and how someone else may not know them. Shoot – A photoshoot. No, we aren’t actually breaking out the rifles – unless it’s a prop. Spot – If Rob says he is uploading a Spot, he’s uploading a commercial. Padoof /Padoofer** – Kati or Allison would like a PDF emailed to them. PO – If you start to get hounded by Pam for not putting in a PO, you better complete a Purchase Order – and fast! Play It Out ** – If Dennis or Nick ask you to ”Play It Out” – that means print it out. Eblast – a really exciting term used to describe an electronic mailing that is sent out in mass quantities. Stinky Tree** – There’s a Chinese Chestnut tree in the C360 courtyard that stinks during the summer time. Poinky Balls** – the prickly balls that fall off the Stinky Tree. Board It Up – The AE’s (Account Executive’s) want to present the creative to the client, so mount it to matte board for presentation.